The Chairperson of Indian Institute of Management (IIM) Bangalore, Dr. Kiran Mazumdar-Shaw, along with the institute Director Prof. G. Raghuram, inaugurated a unique Case Recording Lab today at IIMB, as part of the premier B-School's efforts in digital learning. Bengaluru: The Chairperson of Indian Institute of Management (IIM) Bangalore, Dr. Kiran Mazumdar-Shaw, along with the institute Director Prof. G. Raghuram, inaugurated a unique Case Recording Lab yesterday at IIMB, as part of the premier B-School's efforts in digital learning. Set up with funding support from Mitsubishi Corporation India Limited and Metal One Corporation India Limited, the laboratory is equipped to record and encapsulate live case discussions. The aim is to create a digital repository of teaching and learning aids that captures the essence of the case method of teaching in the IIMB classroom. IIMB has offered Massive Open Online Courses (MOOCs) to more than five lakh global learners in various core and specialized management subjects through the IIMBx MOOCs Programme. Videos are the backbone for delivering pedagogically designed digital content to learners and with this lab, IIMB has strengthened its technical capability to produce world-class MOOCs, said a statement from the B-School. "The country needs to leverage MOOCs on a massive scale to enable millions of Indian youth access high-quality education. IIMB has taken great strides in the area of making management education accessible through digital platforms. 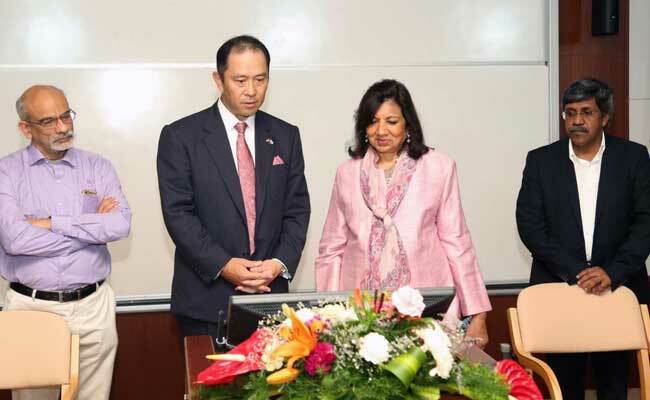 This lab is another instance of the institute's continued focus on technology innovation to make education effective and far-reaching," Dr. Kiran Mazumdar-Shaw said while inaugurating the Case Recording Lab. Observing that IIMB has taken a very strong lead in providing quality digital learning in the management education space to Indian and global learners, she shared that when she visited MIT recently, she learnt that IIMB is one of the most important partners of the edX platform and the initiatives are seen as 'problem solvers' on the platform. Dr. Mazumdar-Shaw lauded the 'incredible reach' of MOOCs, calling it the true democratization of education. In his opening remarks, MCI Chairman and Managing Director Eisuke Shiozaki, said: "It is a great pleasure to be associated with IIM Bangalore and with the project which will allow education to reach to millions of students across the globe." Describing the IIMBx Case Recording Lab as "another addition to the global IOT movement", he said he hoped that the lab would go a long way in supporting future managers and decision-makers of India. Professor G. Raghuram, Director, IIMB, emphasized IIMB's strong focus on reinforcing Indo-Japan ties in the domain of management education and said, "IIMB is thankful to Mitsubishi and Metal One for their support in our technological endeavor. We hope that the Case Recording Lab is one of many initiatives that the institute accomplishes in collaboration with our Japanese partners."